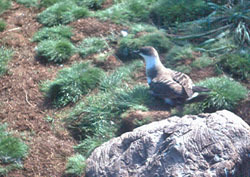 Great Shearwaters or Petrels breed in long burrows on the islands, and can be seen feeding in large rafts on the surrounding sea during the season. tristandc.com is pleased to be working with Rob Ronconi, (from the Grand Manan Whale and Seabird Research Station situated on Grand Manon Island in the Bay of Fundy, Eastern Canada) who was organised the tagging and monitoring of Great Shearwaters as they return from Canadian waters to the Tristan da Cunha Islands, where they breed. 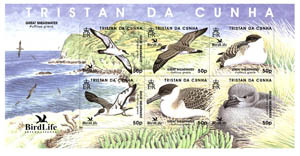 This page contains background and pictures of these sea birds, more information about the 2008 project, updates on the progress of the 2008 tagged birds (named after Tristan families), and links to Rob's website with more information. 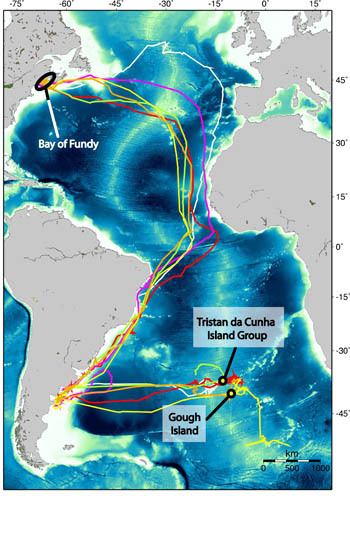 The map, left shows the migration route of birds tagged and monitored during Rob's 2006 Great Shearwater project. We intend to publish a 2008 map, together with a full report, in the February 2009 Tristan da Cunha Newsletter. Flew past Tristan islands 27 Sept. Early October off Cape, returning to Tristan 1st Nov.
Hugged South American east coast until 15 November - arrived Tristan islands 18 November - then headed back east to off Argentine coast again. 1000 km south east of Bay of Fundy. Off Uruguay 5th September, passed Tristan 6th October, off Cape end October, headed SW near Gough, then returned to waters off Cape 22 November. the heading west towards Tristan. 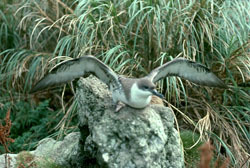 The great shearwater or petrel (Puffinus gravis) has a wingspan up to 118cm and weighs up to 1.1kg. It breeds in burrows up to 1.5 m long dug into peat and is strongly seasonal, returning to colonies from late August to lay single eggs in November which hatch in January and chicks fledge by May. The photograph left was taken on Nightingale Island where the peat soil is honey-combed with their burrows occupied during the October - May breeding season. 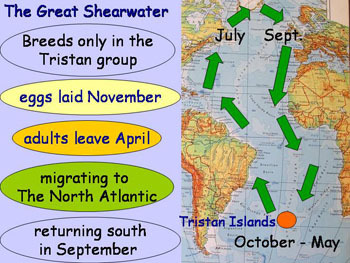 Near endemic to the Tristan islands, the birds all migrate to the North Atlantic in winter, most travelling to waters off Newfoundland and Greenland for June and July and returning along a more easterly route. which is being monitored by scientists from the Grand Manan Whale and Seabird Station in the Bay of Fundy, Eastern Canada - see photographs, information and links below. The species is not threatened, with an estimated 2-3 million pairs at Nightingale, 2 million at Inaccessible, 1 million at Gough, and possibly a few pairs who have survived human and rat predation on Tristan. 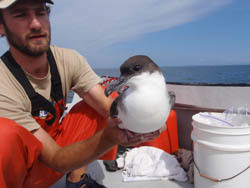 Rob Ronconi, representing the Grand Manan Whale and Seabird Research Station situated on Grand Manon Island in the Bay of Fundy, Eastern Canada, has contacted www.tristandc.com with details of the work to attach a radio tag to Great Shearwaters and monitor their southern migration, publishing updated information via the www.seaturtle.com website. 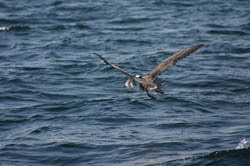 Eight birds were tagged and released between 14th-30th August 2008. They have been given the names of the seven Tristan surnames: Glass, Swain, Repetto, Hagan, Green, Rogers and Lavarello with the addition of Lambert who founded a temporary American Tristan settlement before his death in 1812. 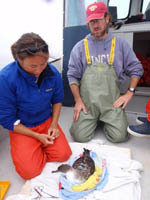 Rob Ronconi, pictured left, provided information for a short article in the February 2008 newsletter, and we hope, with his support to publish a fuller article on Great Shearwaters and their migration in the February 2009 edition. Visitors can link direct to the updated website giving further details of the project, an updated map showing the current location of the birds, and sign up for daily updates.